In KosekGroup, we historically started to study the industrial process of polystyrene particles foamed with pentane. Later, we broaden our expertise in the experiments and especially in the modelling part. We developed new methodologies and models not only for polyurethane and polystyrene foaming. 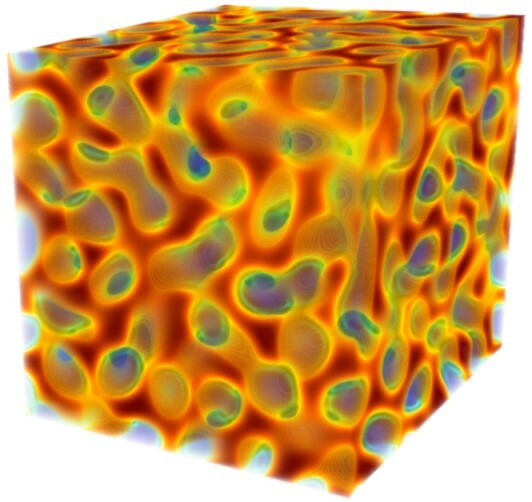 Our models describe the foaming process from bubble formation up to foam stabilization and they predict thermal and sound insulation properties. Transient Hot Bridge device (for thermal conductivity, diffusivity and specific heat measurements of samples). We also study preparation of foams with superior properties made of sustainable, bio-based polymers, such as poly(lactic acid) (PLA), polycaprolactone (PCL), or polyhydroxybutyrate (PHB). Morphology descriptors that enable to automatically describe the foam morphologies from image analysis . Moreover, we are continuing in broadening our knowledge, for example by studying other polymers samples, including biopolymers, and we are having a deeper insight in foaming stages such as nucleation and coalescence in early stages using mathematical models. Here you can read a university website article (in Czech) on polymeric foams prepared by Andra Nistor and Pavel Ferkl. Nistor A, Topiar M, Sovova H, Kosek J. 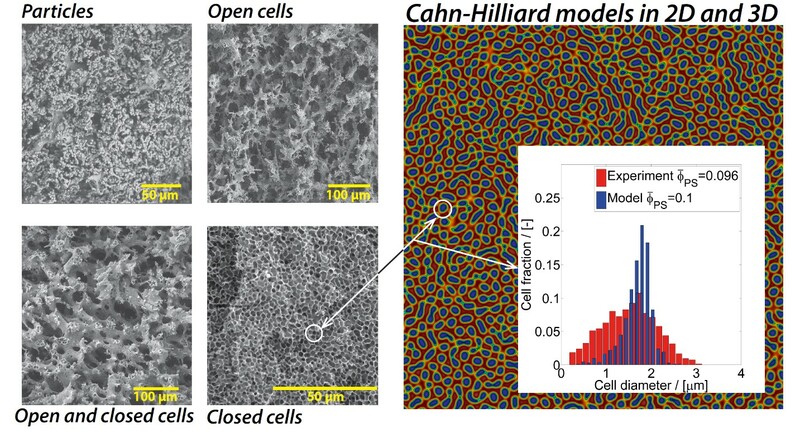 Effect of organic co-blowing agents on the morphology of CO2 blown microcellular polystyrene foams. The Journal of Supercritical Fluids. 2017;130:30-39. Nistor A, Rygl A, Bobak M, Sajfrtova M, Kosek J. Micro-Cellular Polystyrene Foam Preparation Using High Pressure CO2: The Influence of Solvent Residua. Macromolecular Symposia. 2013;333(1):266-72. Sovova H, Nistor A, Topiar M, Kosek J. Vitrification conditions and porosity prediction of CO2 blown polystyrene foams. The Journal of Supercritical Fluids. 2017;127:1-8. Ferkl P., Karimi M., Marchisio D. L., Kosek J.: Multi-scale modelling of expanding polyurethane foams: Coupling macro- and bubble-scales, Chemical Engineering Science, 2016, 148, 55–64. Ferkl P., Pokorný R., Kosek J.: Multiphase approach to coupled conduction–radiation heat transfer in reconstructed polymeric foams, International Journal of Thermal Sciences, 2014, 83: 68–79. Ferkl P, Nistor A, Podivinska M, Vonka M, Kosek J. PU foams: Modelling of heat insulation properties and their degradation in time. Computer Aided Chemical Engineering, 2017, 40:475-480. Vonka M., Nistor A., Rygl A., Toulec M., Kosek J.: Morphology model for polymer foams formed by thermally induced phase separation, Chemical Engineering Journal, 2016, 284: 357-371. Nistor A, Vonka M, Rygl A, Voclova M, Minichova M, Kosek J. Polystyrene Microstructured Foams Formed by Thermally Induced Phase Separation from Cyclohexanol Solution, Macromolecular Reaction Engineering, 2017, 11(2):1600007. Nistor A., Toulec M., Zubov A., Kosek J.: Tomographic reconstruction and morphological analysis of rigid polyurethane foams, Macromolecular Symposia, 2016, 360 (1): 87-95.